Home » News » Happy birthday Sputnik ! Fifty years ago, on October fourth, 1957, the first human-made satellite begun its orbiting around our planet. This was a major event as it launched a race to space between the two super powers of this era, the United States and the USSR. (now the Russian Federation). The image of the day by the NASA (APOD) is of course dedicated to this anniversary and several newspapers talked about it. Sputnik means “traveling companion”. Despite the innocuous sounding name, the launch of planet Earth’s first artificial moon, Sputnik 1, by the Soviet Union on October 4, 1957, changed the world and set in motion events which resulted in the creation of NASA and the race to the Moon. Sputnik 1 was a 184 pound, 22 inch diameter sphere with four whip antennas connected to battery powered transmitters. The transmitters broadcast a continuous “beeping” signal to an astounded earthbound audience for 23 days. 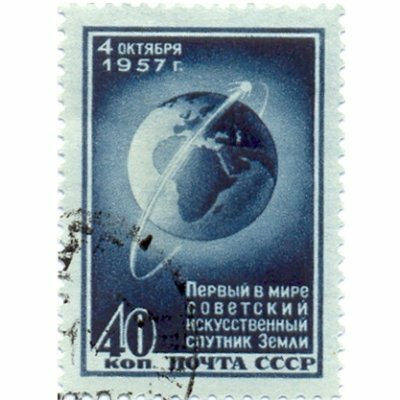 A short month later, on November 3, the Soviet Union followed this success by launching a dog into orbit aboard Sputnik 2. Le magazine Ciel & Espace a publié ce mois-ci un très bon hors série dédié à cet évènement retentissant : “Spoutnik, 1957 la véritable histoire de l’espace“. Je vous le recommande chaudement si vous êtes passionné(e) de conquête spatiale.